Liverpool started the game in the 3-5-2 formation they used against Man United last week. Sakho, Skrtel and Toure providing the back line. I was a bit unsure of this at first as I’d much rather 4 defenders at the back. Early on, Sturridge was fouled on the edge of the box and Steven Gerrard stepped up to take the set piece. He curled it hard at the bottom left corner and Sunderland keeper, Keiren Westwood, managed to parry it away, only for defender, Martin Skrtel to latch onto it and slip it into the back of the net. Unfortunately for the away supporters, the linesman instantly gave it offside. Sunderland certainly weren’t playing like a side at the foot of the table, with their supporters readily backing them and their attack putting Liverpool’s defenders under a lot of pressure. There was an injury scare for Liverpool’s returning star, Luis Suarez, when a heavy challenge caused him to receive treatment for a sore thigh. Lucas went in on a reckless challenge and conceded a free kick in a nice position. Sunderland Swede, Larsson rifled it past old boy, Simon Mignolet, only for it to strike the crossbar, saving Liverpool from embarrassment. Sunderland were unable to convert the 60% possession they had for the first twenty minutes though for a team that had no shots on target last weekend, they had managed seven attempts already in the opening quarter. Against the run of play, Daniel Sturridge messily latched onto a cross into the box and what initially looked like a header, flew into the back of the net. Liverpool were one up at the Stadium of Light but the replay seemed to show that it was Sturridge’s arm that had knocked the goal in. It was given though and you have to take your lucky breaks when they are given. Soon after Sunderland forced a few corners, but then Sturridge broke again down the right flank and banged an easy ball into the box for Luis Suarez to make his premiership return a success as he easily tapped it into the back of the net to double the Reds’ lead. Just before half time and Mignolet manages to keep his clean sheet with a stunning close range save. Liverpool get to half time two up and looking a lot healthier for it. If they can keep the scoreline as is for the rest of the game then they will ascend to second in the league. Gerrard has looked a lot stronger this match and has dictated the pace of the first half, though Sunderland’s performance hasn’t been bad and they can feel aggrieved at going in to such a deficit. Sunderland continued plying the pressure early in the second half and were finally rewarded when Emanuele Giaccherini finished off an attack with a cracking strike which Mignolet should have got to but it slipped past into the back of the net. Mignolet managed to pull off a good save, redeeming himself a little, when Gardner made a good attempt on target. Sunderland were certainly looking like a strong side and I think that sacking the manager was a good move as it seems to have fired up their players. Liverpool, looking the worst of the two sides in the second half, managed to get forward and Victor Moses forced an unbelievable save from the Black Cats’ keeper. Victor Moses was looking like one of the better Liverpool players, with some deft touches, good runs and nice passing, thus far is a certain contender for man of the match. Sunderland started making the substitutions with less than 20 minutes left, Lee Cattermole, who’d made some good stops, making way for Ondrej Celustka. Victor Moses was substituted for Liverpool, being replaced by Raheem Sterling, Henderson moving into the middle with the youngster taking up a place on the wing. I thought that maybe Henderson, who’d been flagging a little, would have been the one to make way. Sterling injected a lot of pace into the game for Liverpool and Jack Colbeck made a cynical foul as he was breaking through on a central run, gaining himself a yellow card. Lucas Leiva became the first Liverpool player to go into the book. It can’t be long before he faces his first ban as he’s picked up a few cards so far this season. Sunderland made another change for the closing minutes, Charis Mavrias coming on for Sebastian Larsson. It was to no avail for Sunderland who soon as the game slipped back to a two goal margin, with Sturridge providing a perfect ball for Suarez to slot home his second. It was a perfect example of our strike force operating in tandem. We could have a devastating partnership on our hands this season. The final whistle topped off a good away victory for the Reds. 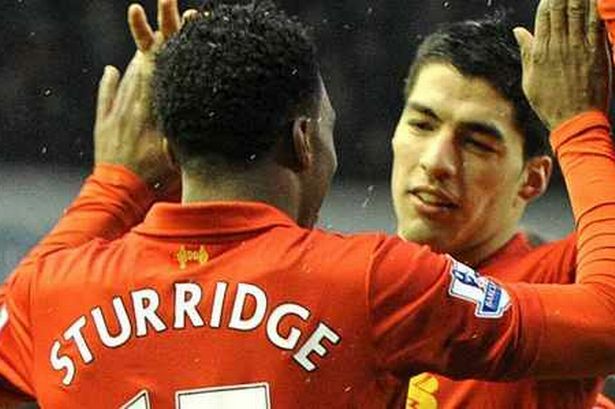 Suarez celebrated the birth of his new baby with a two goal comeback and Sturridge was back in the goals. We climb up to second in the League now, with only Arsenal above us. Sunderland looked like a side that could maybe avoid relegation. I’m sure that they will make life difficult for other premiership sides if they play as well as they did today against us. We have had a good weekend, taking advantage of three top four contenders all dropping points. I think our mini bad run is over and Liverpool are back as a force to be reckoned with. Man Of The Match: Daniel Sturridge – He was back in the goals today and has scored eight out of Liverpool’s last ten goals. He also set up both of Suarez’s returning strikes. Sturridge looked good whenever he moved forward and was our danger man for the day.